VietNamNet Bridge - Da Nang residents are thirsty for water as hydropower plants are storing water for electricity generation. Nguyen The Hung from the Da Nang University of Technology said that Da Nang lacks water because of the unreasonable development of hydropower plants. The Dak Mi 4 hydropower plant has changed the current, causing the volume of water from Quang Hue to Vu Gia and Thu Bon rivers to decrease. Hung said that the rainfall has been low this year, which is a reason behind the need for water. However, he said if the rainwater had been used only for daily activities and production, Da Nang would not lack water. As much as 80 percent of water volume goes to hydropower plants, and only 20 percent goes to the lower courses, causing water shortages in Da Nang. In the dry season, when the water level at hydropower reservoirs falls, the hydropower plants tend to close the dams to prevent water from flowing to the lower course. “If providing electricity in rush hours, when the water supply is short, the prices will be higher. Thus, hydropower plants try to optimize their profit. Storing water is what hydropower plants do to ensure the stable electricity generation in dry season,” Hung explained. “And when hydropower plants optimize their profits, the benefits of lowland people are neglected,” he said. The same problem may occur in other provinces and cities as well. 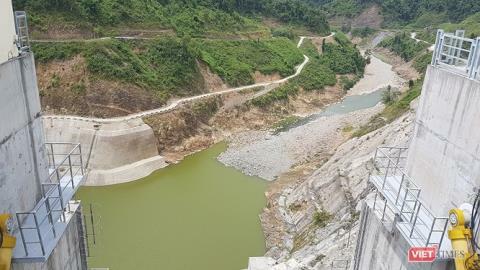 On the upper courses of Da, Thao and Lo Rivers in Chinese territory, many hydropower reservoirs have been built, including seven reservoirs on Da upper course, eight on Lo-Gam and some large reservoirs on Thao River. They have had a negative impact on streams, leading to the water decline and depletion. An analyst pointed out that there are many existing problems in hydropower plant management. Investors report inaccurate figures, thus making it difficult to schedule water storage and discharge. In some cases, investors register hydropower projects just to exploit forests and develop real estate projects. “With the current management, the flooding in rainy season and water shortage in dry season will be a common situation in many cities and provinces,” he warned. According to Hung, in other countries, hydropower plant management is implemented differently. For instance, Vu Gia and Thu Bon could be considered a valley and put under the control of a national committee. The committee would be in charge of managing all the activities in the valley, including the hydropower plants’ water storage and discharge. In Vietnam, the management is undertaken by many different units, while principles are ignored. “There must be a master plan on the use of water resources, and hydrometeorological forecasting agencies play an important role,” he said.